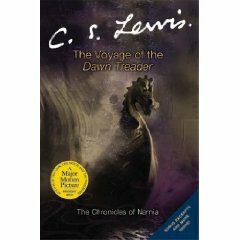 The Voyage of the Dawn Treader by C. S. Lewis – It's Time to Read! Book five in the Chronicles of Narnia sees the intrepid Edmund and Lucy returning to Narnia–with their beastly cousin Eustace in tow–on the ship The Dawn Treader where their old friend Prince Caspian is searching for lost friends of his father’s. As the children take to the Eastern Seas in their hunt for the friends they find themselves embroiled in a dangerous adventure that leads them once again into the arms of Aslan the lion. This is the fifth book in the reading order of The Chronicles of Narnia. In this book we only see two of the childern – Edmund and Lucy, as they go on their final journey through Narnia. The adventure starts in their Aunty’s house in Cambridge, in a room with a picture of a boat hanging up. On careful examination they discover the boat is Narnian, and all of a sudden they are in the sea, and not alone, they have their hideous cousin Eustace with them! They are rescued by Caspian and set sail in search of seven friends of Caspian’s father, who had been out-lawed by his evil uncle. Their adventures lead them to pirates, dragons, sea people and of course, Aslan. They travel to the end of the world, and see all sorts of magic, goodness and evil. I enjoyed this book. Not my favourite of the series but still enjoyable. This book is full of fantasy, with the dragons and sea creatures, and all sorts of other magical beings. It was a good book, I had fun reading through it. I was a bit disappointed it was only Edmund and Lucy this time, but I was aware that would be the case. I liked having Caspian in the book though, for a bit more consistency. We only really get fleeting glances at Aslan, but he is always there to teach them a lesson and help them out. I didn’t really have a favourite character this time round. Overall, I found this book to be enjoyable like the others but not the best. I think both adults and children will like this story. It was easy to read and had its fair share of adventure and fantasy.